Kouign Amann is a classic French pastry— buttery, sweet, and indulgent. Don't be put off by the lamination process or long rest times, since these are a very accessible pastry that are hard to get wrong. Enjoy them as a weekend baking project and add a real wow factor to any spread. This Kouign Amann recipe is a classic French pastry— buttery, sweet, and indulgent. Don’t be put off by the lamination process or long rest times, since these are a very doable pastry that are hard to get wrong. Enjoy them as a weekend baking project and add a real wow factor to any spread. As an entirely self-taught baker whose culinary education has mostly come from in the school of hard knocks (or rather fallen bread), much of what I’ve learned comes from the generosity of professionals who share their wealth of knowledge, skill, and recipes. One of the people I admire most in the pastry world is Dominique Ansel. You should read his cookbook– the creativity originality that goes into all of the creations for his bakery is so well thought out and stunning. Whether it’s a new flavor for the famous Cronut or creating a pine cone out of chocolate, mousse, and powdered sugar, everything is bursting with originality. I’ve been to the LA location twice with ambitions to visit all of them. 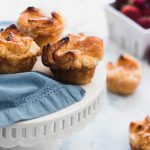 The fact that they can nail the “basics” like croissants, pain au chocolate, or even these less famous Kouign Amann every bit as well as something exotic and original solidifies their world class standing. But it’s a tribute to the fact that classics are, well, exactly that, the great chef himself has declared the Kouign Amann as one of his personal favorites in the pastry case. And lucky for us, they can be made without too much trouble in your own kitchen. No pastry degree required. The Kouign Amann is a classic from the Brittany region of France. I first heard of them on a television segment when we lived in France post-wedding. The thing I remember the most was the television personality talking about HOW MUCH BUTTER went into them, almost as if it was a bad thing. Is more butter ever a problem? Traditionally, Kouign Amanns are the size of a cake, but these days it’s more common to find them in smaller, individual portions. It actually makes them cuter in my opinion. All of the sugary, laminated layers can ruffle and make their own little pattern. These are essentially croissants with sugar worked into them, but never fear. The much simpler shaping saves a great deal of the time and finesse that croissants require and also removes a lot of the frustration that they can bring. After all, the muffin cups or pastry rings do most of the work for you. So if laminated doughs are on your to-bake list, these might be a starting place. Even if they’re not, maybe these will put them there? And no matter what, you’ll end up with a delicious, beautiful little pastry. Plus a few more for sharing. Kouign Amann is a classic French pastry— buttery, sweet, and indulgent. Don’t be put off by the lamination process or long rest times, since these are a very accessible pastry that are hard to get wrong. Enjoy them as a weekend baking project and add a real wow factor to any spread. In the bowl of a stand mixer fitted with the dough attachment, combine the flour, yeast, and salt. Add the melted butter and water, ten mix on low speed until the dough is completely mixed (about 2 minutes), then on high for 5-6 minutes. Turn the bowl onto a lightly floured counter, then knead it into a ball. Place it in an oiled bowl and cover with a tea towel or plastic wrap, and let it rise for an hour. Place the cold butter between two sheets of plastic wrap, and using a rolling pin bash/smash it into a square about 6 inches–I prefer to leave the butter out for a little while before this step so that it can be shaped into the correct size without breaking into chunkds. Place in the fridge to chill while preparing the dough. To roll it with the dough, you want it to be cold enough that it won’t melt into the dough, but soft enough that the block is slightly bendable, and you can leave an indentation by pushing on it gently with your finger. Repeat the letter fold 2 more times for a total of 3 folds, chilling between each. When you are ready to make the Kouign Amann, grease 12 muffin tins well and preheat the oven to 375°. Remove the dough from the refrigerator, roll it out as before, and sprinkle with about half of the granulated sugar. Fold it in thirds again, then roll it into a rectangle 12×16 and sprinkle with the remaining sugar–I like to give it another quick roll or two with the pin to help the sugar stick to the dough. You also want to work quickly at this stage so that the sugar doesn’t begin to dissolve– if it does, you’ll not get the beautiful carmelization in the final layers. Trim up any very ragged or uneven edges on your rectangle of dough, then cut it into 12 4″ squares. Bring the corners of each square up to it’s center, then gently tuck the dough into one of the muffin tins. Repeat with each of the squares of dough. Bake for 30-40 minutes, or until the tops are golden brown. If the corners start to get too dark, you can cover them with foil. After removing from the oven, let them sit for about 5 minutes, then remove them from the muffin tins. Be very careful to not burn yourself on the sugar, and don’t let them sit for too long in the tins or they will be stuck. These are best enjoyed the day they are made, but you can also freeze them and crisp them up in the oven before serving.